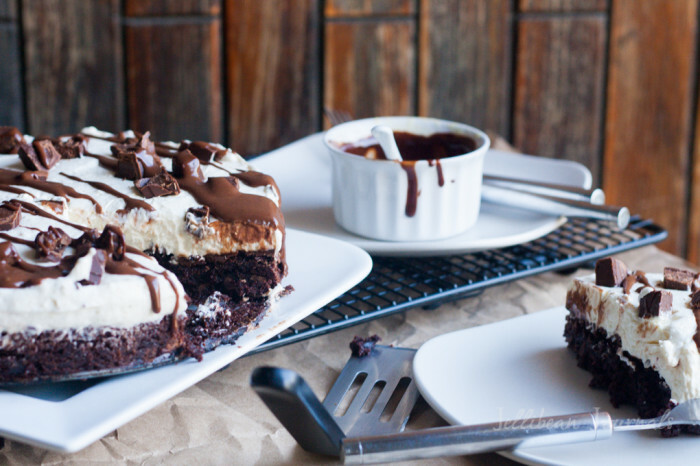 Dense, fudgy brownies layered with tangy cheesecake topping studded with chocolate mints and drizzled with chocolate ganache. Who’s in? My husband spent more than a month deciding on what he wanted as a birthday dessert. We sang “Happy Birthday” with friends and even went to the beach for a mini birthday getaway before he finally chose chocolate mint brownie cheesecake a month after his birthday. 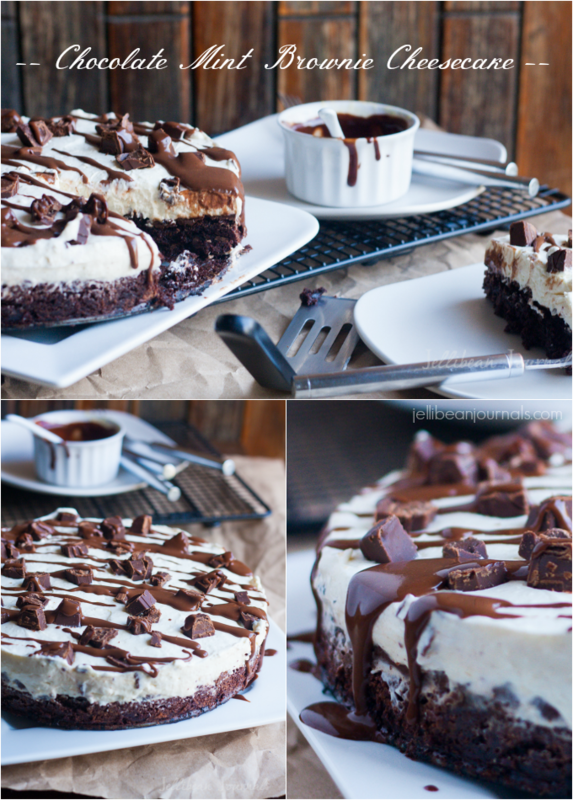 Husband earned every last sweet forkful the week we finally baked this decadent brownie cheesecake. He spent hours under the hot sun cleaning up our messy lawn, rotating the soil in the garden, and even putting up a fence in our yard so the littles can play outside safely. He deserved this lush dessert and so much more! 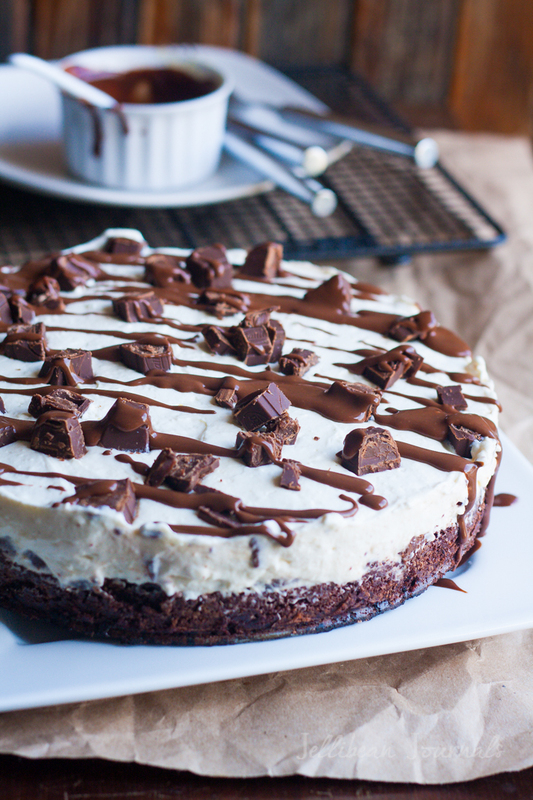 This brownie cheesecake is rich. Let’s just say that I, the self-professed Dessert Queen cannot eat more than one piece. It’s filthy rich and worth absolutely every.single.calorie. I mean, just look at this… Aims fork at screen. Did I mention that it’s easy to make too? With the help of my favorite brownie mix, all you have to do is bake the brownie layer, whip together the cheesecake topping, and layer it all together. The chocolate ganache is a matter of heat, stir, pour. Folks, it really doesn’t get much simpler to get a sensational dessert out of your very own kitchen. Trust me, anybody can do this! Just be sure you take pictures, ’cause this bad boy doesn’t last long! Bake brownies in 9" springform pan or cake pan according to package. While brownies are still warm sprinkle with approximately 10 chopped chocolate mint candies and allow to sit a few minutes to soften. Spread softened candies over brownies. Cool completely. Beat cream cheese in a small bowl to soften. Set aside. Whip cream to soft peaks. Slowly add powdered sugar and whip to stiff peaks. Slowly fold about 1 cup of whipped cream into softened cream cheese. Gently fold this lightened cream cheese into whipped cream to combine. Spread over brownies. Refrigerate. Add chocolate chips to a small measuring cup. Heat ¼ c. cream and pour over chips. Set aside 2 minutes and then stir to combine. Drizzle over fully chilled cheesecake. Serve sprinkled with chopped candies. Now, you may be wondering why in the bejeezers this isn’t green and brown, like most mint chocolate desserts. To tell you the truth, using food coloring really freaks me out. I get it that fresh mint leaves are green. I do not get why adding green food coloring to mint-flavored foods would ever boost it’s mint factor. Anybody with me? What strange-but-common notions about food really irk you? Or am I just an oddball? While you’re here, don’t miss these bizarrely addictive diet-breaking treats! This is so rich and decadent. I can just imagine myself indulging and enjoying every single bite. Yep Zainab, this one’s a diet buster for sure! I make myself feel a little better indulging in it because I can only manage a tiny sliver-sized portion at one sitting because it’s so rich. Seeing that tiny piece of cheesecake makes me feel like the calorie count couldn’t be too bad 😉 Thank you for stopping by. Hope you have a beautiful weekend. Oh my goodness, I am seriously considering going to the store and buying everything for this as soon as my son wakes up. This looks amazing!!!! Chelsea, I live right in front of a grocery store. You have no idea how often I jet over there to make the yummy recipes I find here in bloggyland. Hope you find a few minutes to nosh on this cheesecake over the weekend. Thank you so much for coming over to say hello! I’m in, it looks super yummy! And happy BDay to your husband. Consider yourself lucky even if it took him a month to decide what he wanted… hubby always says “I don’t know”… I’ve been looking for an “I don’t know” recipe for a while but still could find one haha. Have a great weekend! Our husbands must be similar, Roxy. Mine usually tells me he doesn’t have any preferences when it comes to restaurants or our weekly menu plan and so I have to take the reins and come up with ideas. Don’t get me wrong, usually I like choosing the meals, but sometimes it’s frustrating, especially when it comes to birthday desserts! Maybe if I stopped showing him all the droolworthy recipes I spot constantly online he’d have a smaller mental library to choose from, to make making a decision easier 😉 Hope you have a fantastic weekend too! Thank you for visiting. What a sweet family picture Jelli!! 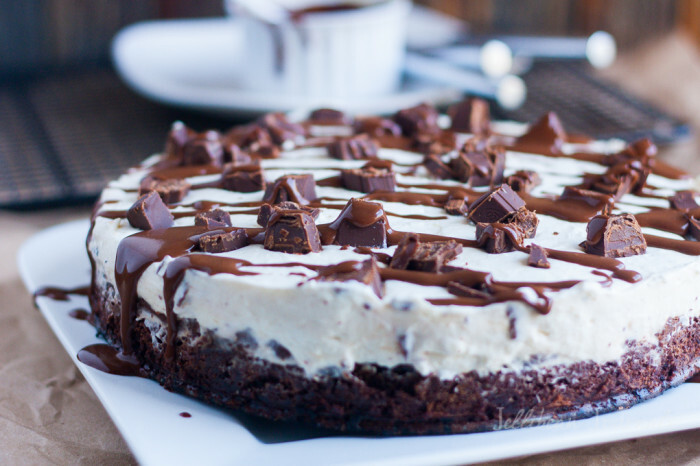 This brownie cheesecake looks like pure decadence!! Thank you, Renee. It really is decadent. Any dessert that I can’t manage to finish off a portion of is truly RICH. This cheesecake is phenomenal but definitely serves a crowd because it’s just overwhelmingly rich. Thank you, Lindsay! You must try it. So sweet of you to share the recipe. I really appreciate it! Thank you so much, Jennifer. It really was one of the best cheesecakes I’ve made, but definitely the kind that you serve in teensy weensie portions- SO rich! Jelli, this is amazing girl!! Fantastic photography and everything! I am digging the boards in the background.. are those real wood boards or a backdrop? Beth, thanks so much for your sweet words! This backdrop is actually my front door. It’s ancient-looking and not in tip-top shape but it serves as a great dark backdrop. Thanks for asking. Oh my goodness, this looks and sounds so delicious. Pinning this one. I just love that family picture. So adorable. Thank you so much, Jen, for sharing the recipe. We took the photo with the camera’s self-timer. With the wind gusting like crazy I was really scared my camera was going to tip over off of the cheapo tripod and get destroyed, so we took this in seconds 😉 Thank you so much for stopping by today. It’s great to see you around again! This looks heavenly! 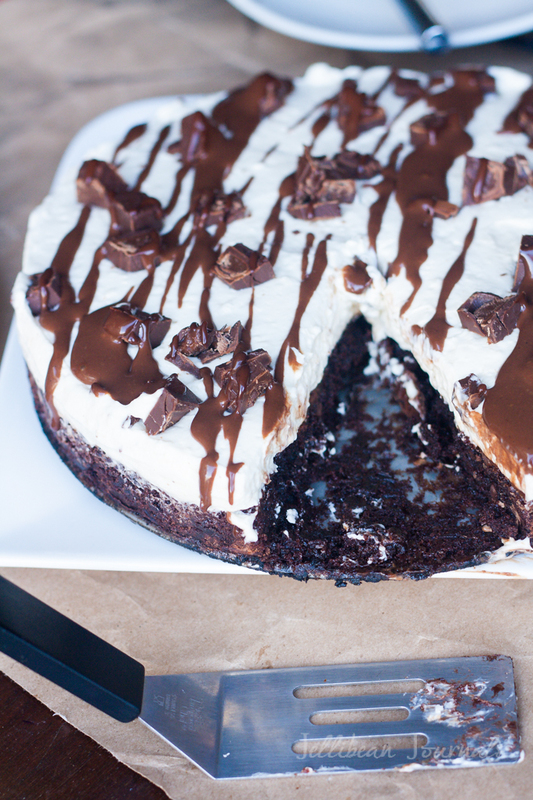 I love chocolate and mint, and with cheesecake it has to be even better. Your blog and recipes look fantastic, by the way — I noticed two choux pastry recipes on your side bar already, and that’s a huge weakness of mine! Marcie, it’s great to meet you this weekend. Thank you so much for stopping by to love on my brownie cheesecake. It is pure bliss and if you try it, I’d love to know what you think! You’re right, I’m currently crushing hard on choux pastry and already have plans for tons of cream puff variations coming up in the next few months. Hope you have a fantastic weekend and stop by again real soon. This looks incredible!!! We are minty chocolate fans over here! Plus cheesecake. YESSSS. 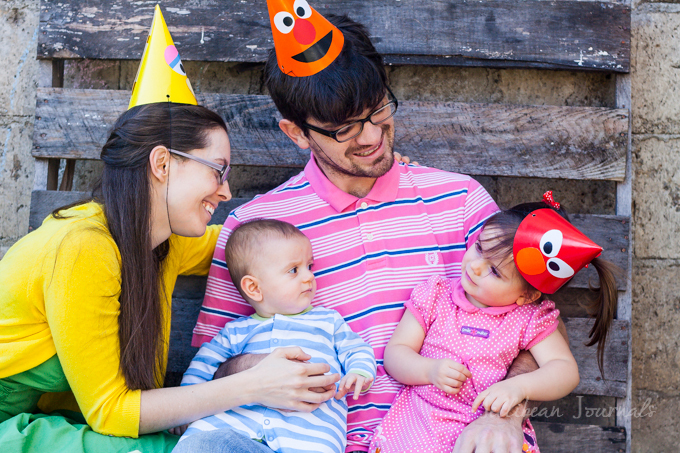 Your family is adorable. Hope you had a fantastic birthday celebration! Thanks, Heather! I’m pretty sure Husband enjoyed turning the big 3-0 although we never had an official celebration, but more of a group party for all of our friends with Feb. birthdays. Hope you find time to give this a try sometime. Have a beautiful weekend. Aaah! 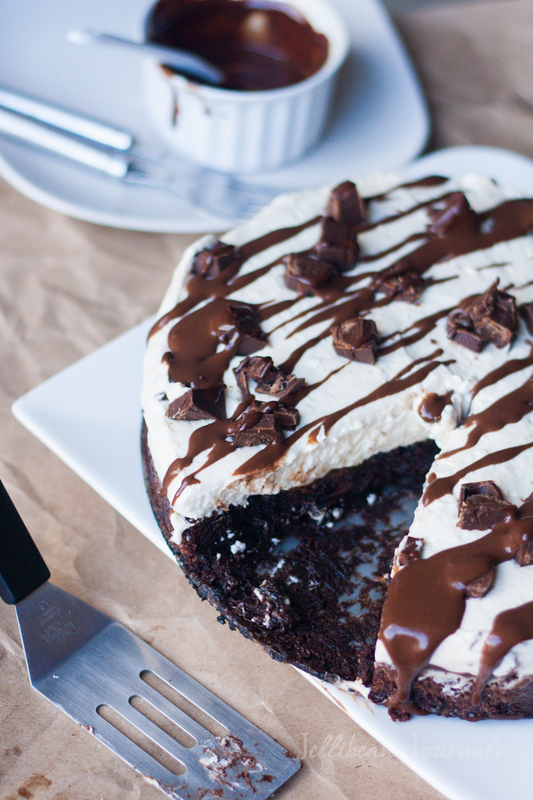 Umm… this so goooood! I am making this as soon as I get some brownie mix! Be sure to come back and let me know how it turned out, Aysh! If you like chocolate mint and cheesecake, you’ll be a fan, I’m sure. Thank you so much for stopping by to visit this weekend. Using brownies as the “crust” is so smart – and wow, does it sound good! So rich and creamy and I love chilled desserts. Mint always makes heavy desserts a little lighter and more refreshing AND of course delicious! You’re right, Mary Frances. I never thought about it that way before, but mint does make rich desserts somehow seem lighter. I wish it worked with the bathroom scales after devouring this cheesecake, haha. Have a great night! Great looking recipe and thanks for sharing at MM tonight! Pinned! PS – like your header…. sorry I haven’t seen it before. Have a good week! Thank you so much, Deb, for sharing the recipe. I always look forward to partying with you and the other ladies at MM every Sunday. Have a great week! Jelli, this looks fantastic!! 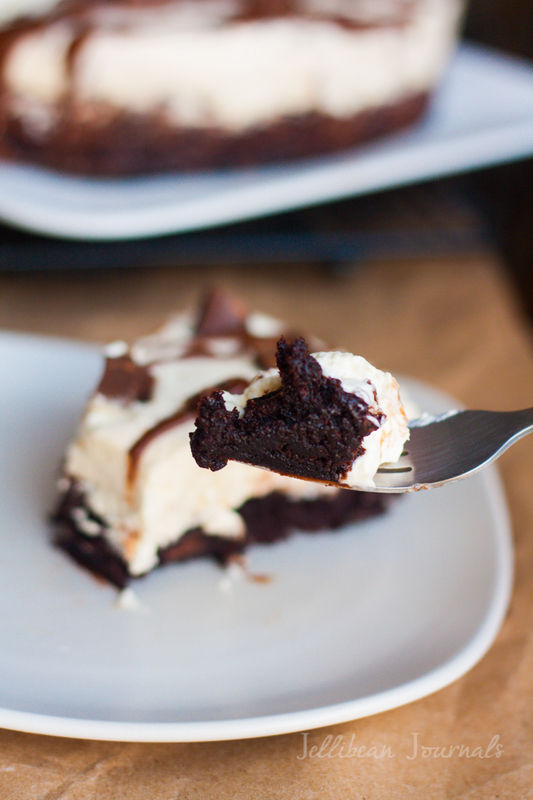 Everything I love (brownies, cream cheese and mints), oh my!! Can’t wait to try this soon. Stopping by from Marvelous Monday. Have pinned! Erin, thank you so much for sharing the post and especially for taking the time to stop by and check it out. I sure hope you find time this week to test-drive the recipe and introduce yourself to a brand new flavor slam dunk! Have a beautiful week and stop by again soon. Um, yum! Just pinned this baby and saw a bunch of other awesome things you’re baking up. Shauna, thank you so much for sharing. We love sweets around here, so you’re bound to find oodles of recipes for your taste-testing pleasure. Happy to meet you this week. Hope you and your family have a gorgeous Easter. OMGeee Jelli, you are killing me on this one! LOVE brownies and obsessed with andies mint candies, totally pinning this one. But need to wait until after my Miami trip to make.. then totally diving head first into this bad boy! Amazing pictures too girl… beautiful! Krista, you sure do know how to make my day cheerier! Thank you so much for your encouraging comments. We definitely enjoyed the cheesecake and will be enjoying it again soon, I’m sure. Hope you have a great trip to Miami. Thanks so much, Jess! Hope you give it a whirl soon. Thank you for visiting. This looks incredible!! 🙂 I would have a hard time not diving face first into this! Your hubby picked a winner of a dessert for his birthday! You’re a hoot, Jocelyn! I can almost imagine you, hands over the head posed in diver’s stance ready to leap right into the cheesecake. Thank you so much for taking a moment out of your weekend to visit. Have a beautiful Easter with your family!